Hi all, I’m new here and I have a problem that I hope to solve with your help. I’m working on a type family in Glyphs (wonderful app!) that has nine weights, both in romans and italics. They are named ‘100’, ‘100 Italic’, ‘200’, ‘200 Italic’ etc, all the way up to ‘900 Italic’. Every italic is style-linked as italic to the roman of the same weight and none of the weights (roman or italic) is linked as ‘Bold’ or ‘BoldItalic’ to any of the other weights. 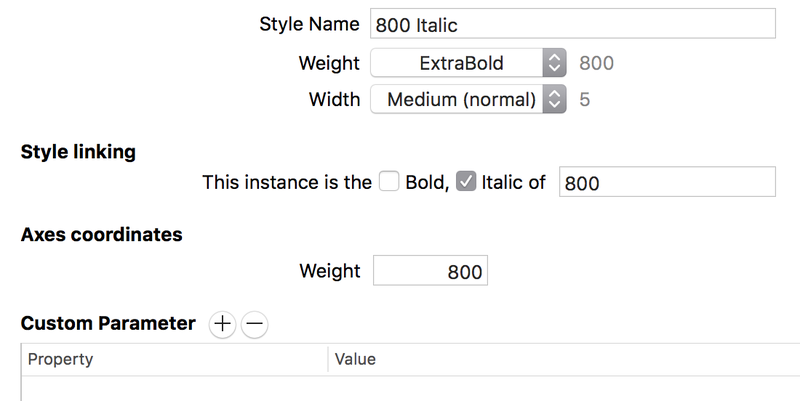 Here’s the problem: In Indesign all weights respond correctly to cmd-shift-I to italicise or de-italicise, except for the 700, 800 and 900 weights. With those weights nothing happens. Is this an Indesign thing or am I doing something wrong? How are you preventing cache problems? Are you using the Adobe Fonts folder? I didn’t link Bold because I’m not sure yet which weight will be ‘Regular’ and which one will be ‘Bold’. The trick with the Adobe folder doesn’t seem to work for some reason, but that’s fine. I’m using Fontexplorer because I’m testing my fonts not just in Adobe apps. I’ve cleared all font caches but the problem persists. Or at least we cannot seriously solve it until you have renamed your font and start using the adobe fonts folder. I have checked the generated fonts and none of the italics appear to be linked to any romans (see images below), still, the 500 weight doesn’t give a problem but the 800 does. I will check your link about font cache problems. For style names like yours, you need to specify to what style you like to link. 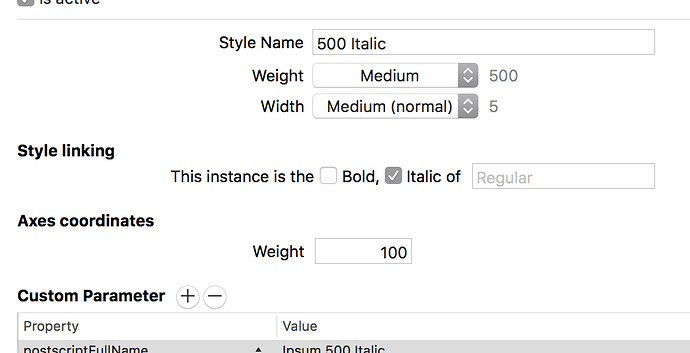 So in 500 Italic add 500 Roman (or whatever the style is called) in the “of [Regular]” field. Yes I know. And it works well for all weights except 600, 700 and 800. The images above are from the output fonts. In the Glyphs source file everything is set like the one below. I got the Adobe fonts folder trick to work now and I cleared the font cache, but the problem remains. Can you send me the .glyphs file please to support (at) (this website without www). I will have a look. Turns out the problem was not in the italics but in the romans. Some roman weights were style-linked as ‘bold’ to other (none-existing) styles which probably messed everything up. After correction everything works as it should.